Pimlico Race Course in Baltimore, MD is host to an annual gathering of like-minded fans looking to share in an experience of love, good-times, and plenty of horsing around. Only these jockeys don’t ride thoroughbreds. 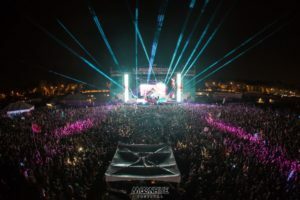 The Preakness takes place in May, but come August the track is filled with electronic music lovers young and old for Moonrise Festival. After a few years of putting on this two-day festival, organizers are starting to figure out the smoothest way for it to run; yet this is not a well-oiled machine. First, one must get into the festival. This requires two things: a wristband and passing through security. Sounds simple, but attendees complained of having to wait an hour to pick-up their wristbands and another hour to get up to security. At that point you are treated like a potential terrorist, having to empty out pockets and bags while they searched through every nook and cranny for the slightest sign of contraband. If they found it you had three options; throw it away, leave, or pay off the person searching you; no trip to Baltimore is complete without a shakedown! This held true even once you were inside the festival, where there was a large security and festival staff presence. Once inside you were subject to a sea of rolling day-trippers all desperately searching for water or shade to beat the stifling heat, which there was not enough of for the number of fans in attendance. Staffers would walk around during shows and squirt water into the mouths of those who needed it, but more hydration stations would have been better. Where things did get better is once the performances started. DJs were given an hour to an hour and a half to perform, all of whom started right on time, making it easy for you to plan who to see and when to see them. Three of the four stages were set up within very close proximity to each other allowing fans to drift from artist to artist without missing much of a performance. The headliners this year were Bassnectar, The Chainsmokers, Tiesto, and Zedd and each one brought it harder than the next. Even “smaller” acts like Grammatik, GRiZ, and Yellowclaw had people dancing and feeling themselves. All in all, as long as you can beat the heat and the security guards, EDM lovers will be all about this festival as the performance of the DJs far outweighs any negativity they would experience.